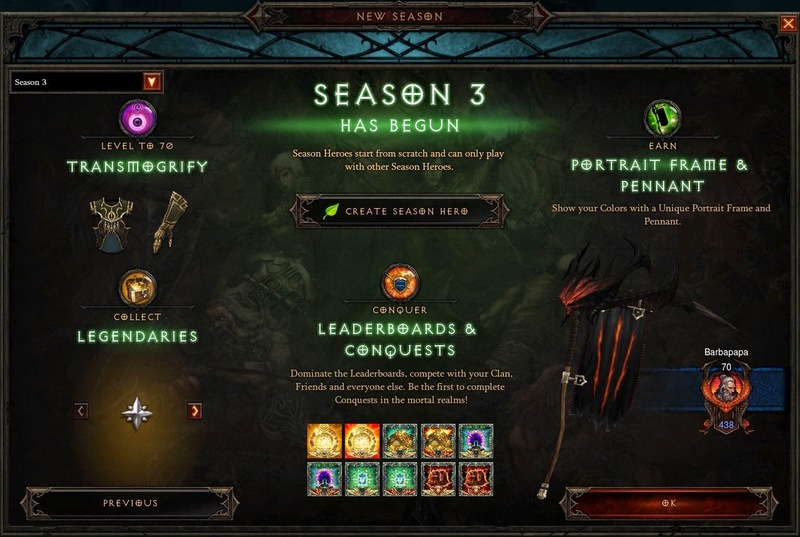 The Diablo 3 Content Patch 2.2 goes live on Tuesday, April 7, 2015 (April 8 in Europe), and Season 3 will be starting worldwide shortly after on Friday, April 10. The start times for all regions can be found here. Patch 2.2 makes many more character builds viable for Torment 6 difficulty thanks to new and reworked items as well as several new game mechanics. Especially hardly used primary and secondary skills including associated (older) legendary items will profit a lot, and defensive shortcomings have been addressed, too, to make such builds work in Nephalem Rifts and higher level Greater Rifts. To accommodate the goal of better performance for all builds in the competitive Leaderboard environment, another batch of seasonal Legendaries can be acquired with the start of Season 3. Following is a list of these new build-/game-changing items incl. links/tooltips from the official Diablo 3 game guide. Note that the links/tooltips of the new patch 2.2 items will not be active before the update has been deployed on the live realms. The unique properties of every item have therefore been added in this preview as well. Your Cold skills now apply Chill effects and your Chill effects now Slow enemy movement by an additional 5% (increases with each level). At Rank 25: Gain 10% increased Critical Chance against Chilled and Frozen enemies. Gain 10% melee damage reduction (increases with each level). At Rank 25: While below 30% Life, you may move unhindered through enemies. Each attack you make against an enemy increases the damage it takes from your attacks by 10% Weapon damage (increases with each level). At Rank 25: Allied players, followers, and pets also benefit from this effect. Note: This planned gem has been removed from patch 2.2 during PTR testing. Summons a Fallen Lunatic to your side every 12 seconds. Your first hit with each cast of a resource-spending attack reduces the remaining cooldown of one of your skills by 1 second. Gargantuan instead summons three smaller Gargantuans, each more powerful than the original. Energy Twister periodically pulls in enemies within 30 yards. Instantly restores 60% Life. Increases healing from all sources by 20-25% for 5 seconds.